Central to the book’s argument is the way new media shapes and challenges social memory and, conversely, how understanding social memory, the stuff that provides a framework for how societies understand historical context and ideological assumptions, is vital in informing the way we preserve new media. The authors assert that social memory often takes two forms, formal and informal. Formal social memory, which is what we most often see practiced by museums and other cultural heritage institutions, focuses on preserving cultural objects in fixed form to maintain the historical accuracy and integrity of the original. Informal social memory, which for example can be seen practiced daily all across the Internet, emphasizes recreation and reinterpretation of cultural objects to keep them alive and relevant. 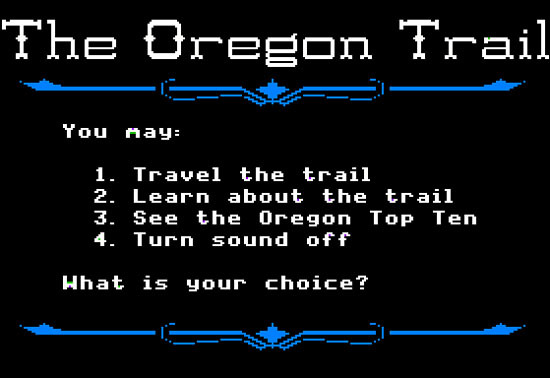 One good example of informal social memory is the website Virtual Apple, which allows users to play almost every Apple II game in their modern Internet browsers using emulators. 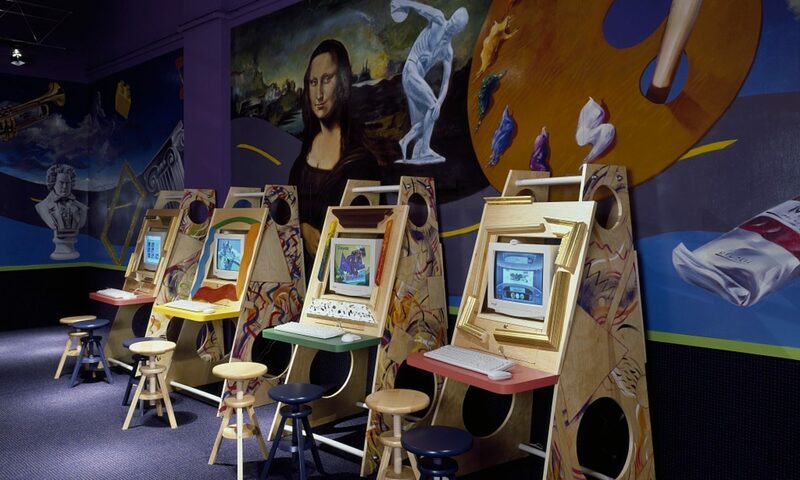 If this doesn’t bring you right back to middle school computer lab, I don’t know what will. Informal social memory, especially in regards to the way we preserve digital works, will likely increasingly inform more formal approaches taken by cultural institutions. Sheila Brennan’s transcribed talk, “Getting to the Stuff,” is all about the way history museums approach (or rather, don’t successfully approach) new media strengthens this hypothesis. Brennan asserts that though museums have been getting better about maintaining and online presence, actual digital collections presence is still woefully behind as museums opt instead for internally interpreted narratives, games, or educational interactive activities. She argues that museums should, in fact, get comfortable putting their stuff online, largely because people have really interesting ideas about how and why artifacts matter to them, and can often bring a new perspective on the collection that museum professionals might otherwise miss. Brennan brings up several examples that we’ve covered in previous weeks, such as the Holocaust’s Museum’s Children of the Lotz Ghetto project and New York Public Library’s “What’s on the Menu?” collection, pointing out different ways museums are engaging their public on the basis of a more informal type of social memory. Unfortunately, many museums are still heavily proprietary about their collections, fearing the consequences of the unvetted hordes gaining access to their artifact metadata. Unfortunately, Brennan argues, this protective instinct could be the downfall of museum collections as an institutional norm. The consequences of greater accessibility? To keep collections relevant, she offers a few suggestions: remember why we’re preserving the stuff in the first place (hint: something to do with the public trust), publish your collection online so that researchers can actually access the stuff, use your digital space to provide context to the stuff, and perhaps most importantly, actually invite outside scholars and enthusiasts to contribute their thoughts and ideas about the stuff. Though Brennan is mostly talking about material culture and collections, her thoughts and those presented in Re-Collection run on similar themes, namely that social memory is important, and deeply informs what we choose to preserve, and how we preserve it, just as much as institutional collections create and affect social memory. Change is scary, I know, but it really couldn’t hurt to consider the ideas presented by Rinehart, Ippolito, and Brennan. As our cultural heritage keeps evolving, whether as born-digital new media or as a digital representation of material culture, so will our methods of interacting with it; ultimately, embracing the future may be the only way of saving our past. The number of bots is also growing rapidly on Twitter, whose open API makes them especially easy to script. The social media company released a statement in 2014 saying that 23 million users were automated accounts, or bots. Don’t assume that they are all trying to get your money, though. In this post, I’ll explore some of the good guys. It is the nature of bots to do the same thing over and over again, with only slight variation. Any single iteration may be interesting, but it is in the aggregate that a protest bot’s tweets attain power. The repetition builds on itself, the bot relentlessly riffing on its theme, unyielding and overwhelming, a pile-up of wreckage on our screens. 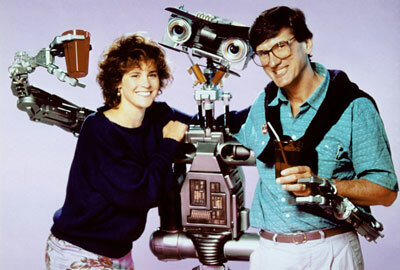 In our line of work, bots have been created to promote cultural institutions by displaying their wares. MOMA created @MuseumBot to tweet images of their collections two to three times a day. These tweets are relatively simple, consisting of an image, sometimes a title, and a link to the item within the online collection. Lubar advocates for bots to fill gaps in access and expose patrons to the agency behind what items make it into an exhibition. Some of his suggestions include tweeting things in storage that aren’t on display, or images of items that were deaccessioned. I find this idea incredibly liberating because it takes the stark polarity of “will this be seen or not be seen?” out of appraisal decisions, and helps shine light on a growing percentage of dark archives. I decided to ask a bot for their opinion on the matter. @OliviaTaters is a bot that was made accidentally by former Colbert Report writer Rob Dubbin. Basically, Dubbin was trying to exploit new language trends in teenage tweets, words such as “actually,” “like,” emoticons, etc. Although the bot was meant to put pressure on these expressions, @oliviatater’s tweets were often funny, witty, or touching, and she is followed and speaks with many teenagers today. To hear more, listen to this hilarious TLDR podcast. As you can see, she wasn’t very helpful, although I guess you could tease out meaning about historically-set videogames outpacing cultural institutions and denial being a part of that relationship? I admit, it’s a bit reaching, but perhaps the ambiguity of language is what makes @oliviataters so compelling. Tim Sherrat makes the point that the bot’s failings are themselves valuable, because they show us what it means to be human and encourages us to analyze and critique the medium. Rob Dubbins describes #oliviatater’s tweets as a kind of literary art in the interview I cited above. @TwoHeadlines , a Darius Kazemi creation that pulls top headlines from Google News and splices them together, is another example of a bot that was originally created for one purpose, but suddenly started producing literary art. One tweeter viewed such headlines as a “magical realist Late Capitalist dystopia.” Kazemi agrees that they could be described as near-future-late-capitalist dystopian microfiction, sort of in the vein of Infinite Jest, where nations, sports teams, and celebrities become the same thing. These headlines reveal the dangers of capitalism and privatization when these trends start to affect people and public entitites. The prolific Kazemi also made @reverseocr , which draws lines until optical character recognition software interprets a word out of them. These examples have made me re-think the bot as not just an annoying spam machine. It has the ability to protest, advocate, soothe, or to inspire. 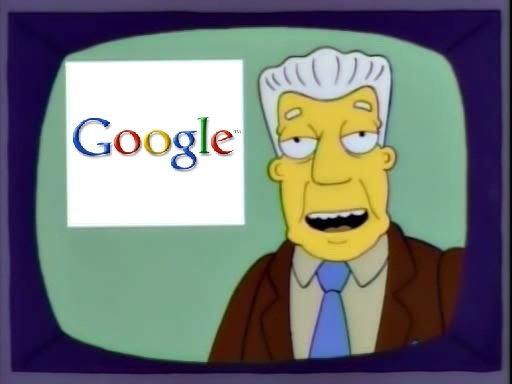 It may even push other sites to make their API available (I’m looking at you, TripAdvisor! ), although that may be too optimistic. Does anyone else have a favorite bot that would fall into one of the categories, or a humanities related one they’d like to share? The September 11 Digital Archive and the Bracero History Archive are two collaborative digital history archives projects that work to record and preserve the experiences of two important chapters in American history. These sites collect and archive oral histories, interviews, images and other documents related to the events of September 11, 2001 and the Bracero program, a “guest worker initiative that spanned the years 1942-1964.” Both of these sites are extremely informative and interactive, and allow easy exploration of a mass of materials, representing exciting examples of how digital archives can be done well. As I reviewed them both, however, I also noticed some other major similarities and differences in how collections are organized, how these archives are representing historical events (and what their historical timing means for both the archive and the user), and how each site is using this digital archival material to foster education and provide additional resources regarding these historical moments. What struck me most about both the September 11 Digital Archive and the Bracero Archive was the wide breadth of resources available on each site. The Bracero Archive contains over 3,000 oral histories, images, documents, and contributed items, and the September 11 Archive holds more than 150,000 items, including more than 40,000 emails and electronic communications, over 40,000 first–hand stories, and more than 15,000 digital images. As Jamie discussed in her post, one of the most exciting possibilities of digital collections is the potential to take everything—to not be bogged down by the difficult appraisal decisions of what to keep, what matters most, and what can be tossed. These two digital sites certainly succeed in creating richer stories by using new tools and contexts to make fonds an argued thing of the past and instead providing access to as much archival material as possible. It was also very clear while exploring these archives that in order to successfully undertake a large-scale digital initiative such as these, collaboration is key. Neither site is the sole creation of one organization, rather they are both co-created projects funded and supported by a variety of grants and sponsors. The Bracero Archive is a collaborative project of the Roy Rosenzweig Center for the History and New Media (RRCHNM) at George Mason University, the Smithsonian National Museum of American History, Brown University, nad the Institute of Oral History at the University of Texas at El Paso, with funding provided by the NEH. 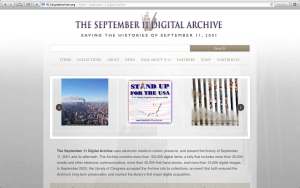 Similarly, the September 11 Digital Archive is a product of the RRCHNM and the American Social History Project at the City University of New York, along with a permanent partnership with the Library of Congress. These partnerships not only allow for necessary resource funding, but also help ensure the long-term preservation of these archives and promote awareness of the importance of such projects. While both sites contain similar layouts and information—including tabs on the background of the projects and staff, collections, and instructions on how users can add their own stories, etc.—they also differ in some ways on format, context, and content. For instance, both sites allow users to view all collection items at once, or sort them by topic, but I found the September 11 Archive to be less easy to navigate. Some of the items were not labeled (only having “? ?” as their titles), and some items, such as email communications, are presented in unfamiliar formats and often do not contain all the identifying metadata, such as sender, recipient, etc. Both sites do not always include full metadata for every item, and dates, creators, and descriptions of photographs, correspondence, and interviews are sometimes missing. I recognize that sometimes this information is not known, and therefore cannot be included, but what can these content and contextual changes mean for research? How does the digital archive affect the dissemination of this kind of information? Additionally, how does the born-digital aspect of these items affect this? While the Bracero Archive contains digital oral histories, and obviously other digital information, these items are not always born-digital and they are most often memories and experiences recorded and shared years after the program ended. In the September 11 Archive, no emails and other material is obviously born-digital, and often created within weeks, or even moments, of the actual event. 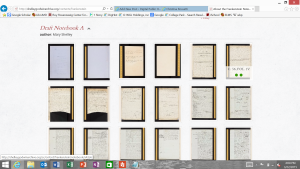 How does this affect how content is presented and organized in the digital archive? Another feature that differs between these two archives is the way in which historical background information and additional resources are presented. 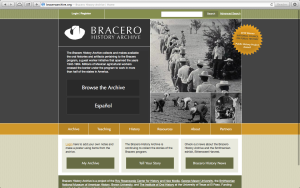 The Bracero Archive contains extensive information on the background of the Bracero program, including a history summary and a large bibliography of selected related scholarship. It also features resources, including video tutorials on how to navigate the site, and three lesson plans outlining how educators can use the collection to teach students about America immigration and labor history. 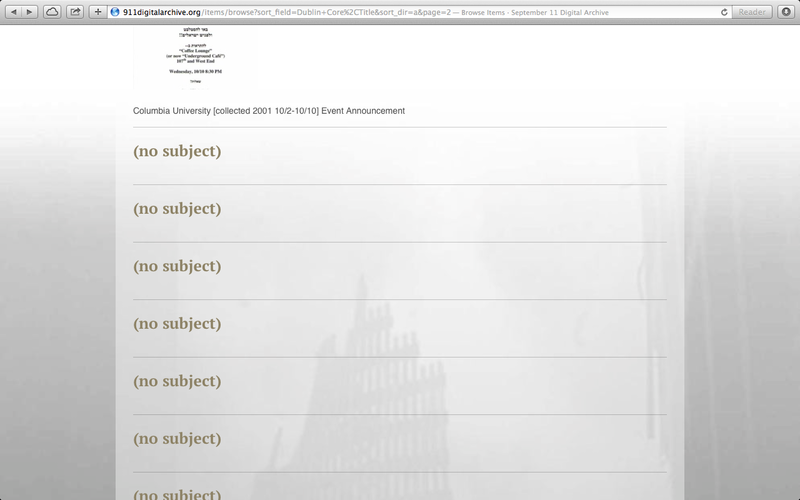 The September 11 Archive, on the other hand, does not contain bibliographies, educator resources, or a historical background narrative, but rather includes a tab on “FAQ’s about 9/11” that contains a timeline of the attacks, the immediate response and consequences, rebuilding efforts, the 9-11 Commission Report, and information on memorials. 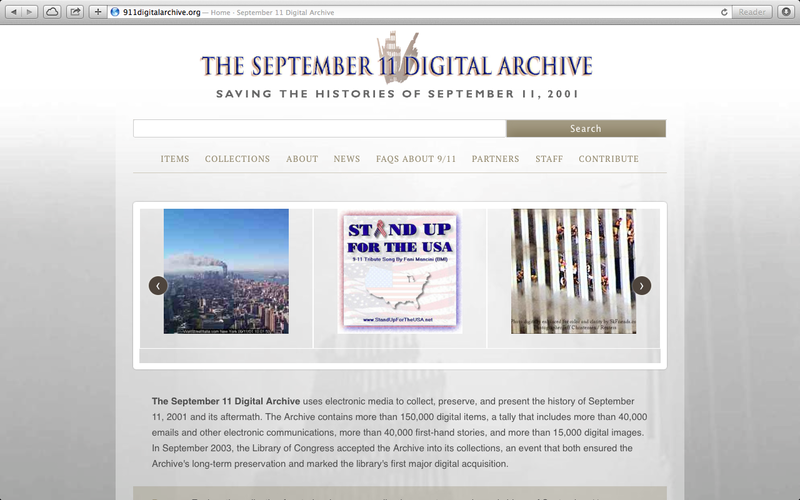 Both sites feature news related to the archive, but this tab on the 9/11 archive contains more up-to-date blog posts and information. These features show the additional resources that become possible—and more easily created and accessed—with digital archives. I was somewhat overwhelmed by how much information was available, and so easily navigated, on both of these sites. The possibilities for more resources like these seem endless, and extremely attractive, when imagining how to create and improve these kinds of digital public history pages. What do we think is the most useful? How should archivists and other creators of these sites best take advantage of the capabilities of digital archives to provide additional information? The Rossetti Archive is terrifying. It is massive and as a recovering student of literature it makes me want to run screaming for the hills because it has everything. I don’t mean everything a scholar could want with rainbows and puppies; I mean everything the man ever produced, the entirety of the journals is poems appeared in, the source materials upon which be based is translation efforts, the major scholarship about him, the works of his friends, mentees, and scholarship about them, and drafts: every possible draft of a poem or painting, plus all the reproductions they could get the creators could get their hands on. It’s all there. Plus, bearing in mind that Dante Gabriel Rossetti (DGR) was both prolific and popular – the leader of an artistic movement – not only did he make a lot of stuff, a lot of people bothered to keep (and his popularity brought attention to the work of others who we now think of as being in the canon, like William Blake). It’s a terrifying amount of material. How is one person ever supposed to read everything when everything is relevant? How can scholarship not be crippled in the face of such an abundance of so much data? Panic attack aside, what the Rossetti Archived is simply a collection of the digitized works of DGR plus as many contextualizing resources as possible. 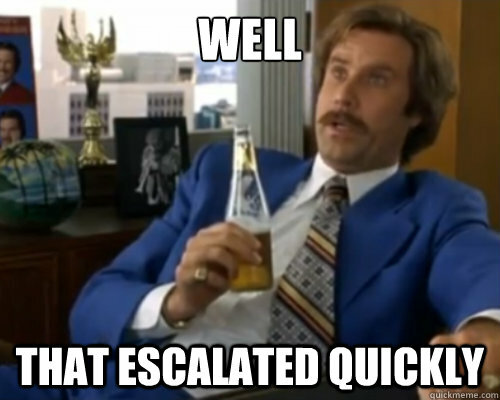 There just happen to be loads of them. Ere go an elaborate searching mechanism. 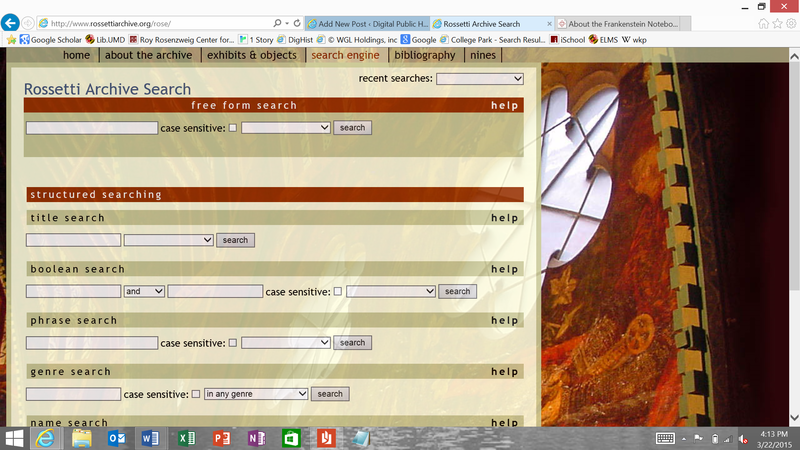 The below is a screen shot of the search engine with all the possible ways of searching. Herein lies my only major criticism of the archive, the search returns are mysterious and lack a way to know why something in particular was relevant to the search. It is otherwise comprehensive, expansive and easy to use, except for the part about actually reading every thing that you get back and considering it complexly as the researcher is meant to do. McGann, who made the thing, is aware of its vastness and complexity and his argument is that by putting it all together, the scholar is no longer bound by the confines of a print edition which like a car depreciate in value the minute it goes to press. The “bewildering array of documents” is a challenge, but it then becomes the privilege of the scholar to decide what is important, what should be included in his or her work of scholarship. The appraisal is put into the hands of the user, instead of the archivist. The intention of the archive is clear and well-fulfilled, but perhaps overly so. The data is so expansive and so robust that it can be difficult to get a grip on something small. There is so much context that it begins to obscure the purpose. When I started playing with the search function, I turned to my default search term, goat; the word I use whenever I’m testing out a new search engine because I think its kind of funny. The results were inconclusive, so I turned to something I knew a bit about; DGR’s sister Christina Rossetti, a poet in her own right, and one I prefer to her brother. 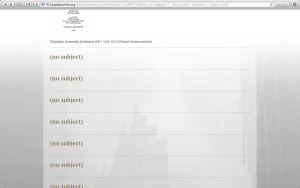 Now with 153 search results, I began to see the outer extremities of the archive. Not every poem Christina wrote was included; in fact I didn’t find the text for any of her works, only references to it where it coincided with her brother’s efforts. But this in itself raises another issue. What the Rossetti archive is attempting to do – and I will argue doing very well – is establishing the authority we associate with scholarly editions and putting it in the public sphere; it is the level up from Wikipedia because it is a moderated source. But what we suddenly lack is a middle ground. There is now vague (and potentially corruptible) overview via Wikipedia or everything that could possibly be associated with the topic via dedicated HyperArchives. 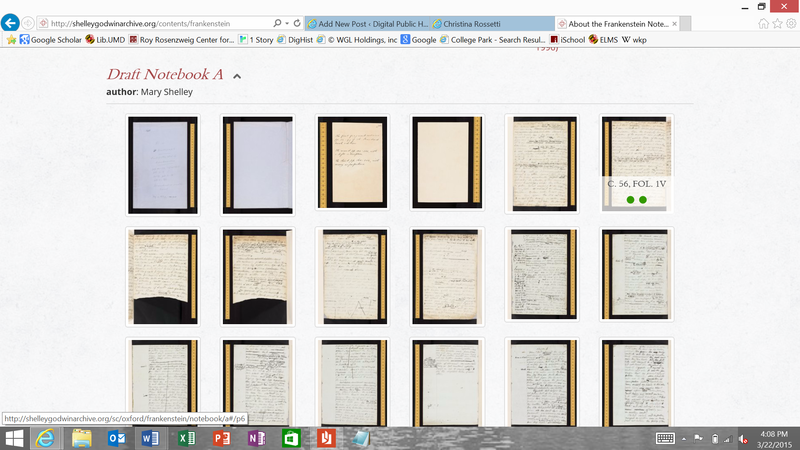 And the same thing is in the works with the Shelley-Godwin Archive, seen above. They have commitments for 90% of the papers of Percy Shelley, Mary Shelley, Mary Wollstonecraft, and William Godwin and they are going to put them all online with transcriptions and search functions. Though right now only Frankenstein is available, what happens when a thorough examination of a text and its relevant contextualizing data for a close reading balloons into data analytics like Morretti’s Distant Readings from Graphs, Maps and Trees? And what does it mean for the Archivists of the world when resources like these take away our call to curate? Are such fantastic resources actually the death of the archival profession? Practitioners and theorists are posing many fundamental questions about the archival profession. Where is it heading? What are its core principles? Is it in jeopardy of becoming obsolete or even ending all together? The questions of what the archives profession is and what it means to be a member of it relates to how we define the archives itself. The articles for this week focus on this definition and the activities and functions entailed when using the word “archive” or “archives.” Archivists claim jurisdiction over what constitutes an archives and are fending off perceived misuse of the word by digital humanists, philosophers, businesses, and everyday people. This defense is part of archivists affirming their authority to decide what it means and their unique fitness to perform this work. At the same time, the changes of the digital era are challenging the applicability of archival theory. In this atmosphere, one wonders about the importance of arguing for a single definition. Professionalization of many occupations in the United States occurred during the Industrial Revolution, a period of uncertainty similar to the changing digital economy that we are experiencing today. As Burton J. Bledstein demonstrated, starting in the late-nineteenth century, groups such as architects, accountants, etc., created professional standards, organizations, and schooling to establish themselves as professions and to gain authority within a specific field. They aimed to define a “coherent system of necessary knowledge within a precise territory, [and] to control the intrinsic relationships of their subject by making it a scholarly as well as an applied science.” Sounds familiar right? It should, because this is almost exactly the same path that archivists followed. The Society of American Archivists (SAA) formed and sets the standards for the profession, the MLS degree (and the legion of other acronym permutations) has become a standard job requirement, and archival science is both a scholarly and applied science. Acknowledging the current state of archives is more complex than I make it out, the situation largely seems positive profession-wise. However, as Trevor Owens demonstrated, other groups have (increasingly so with the advent of digital world) and continue to use the word “archives” under their own definitions and undermine the archivist’s professional authority over this term. It is here where many, such as Kate Theimer, reassert the definitions established by SAA based on the traditional notions of an archives. These definitions focus on the ideas of controlling materials based on provenance, original order, and collective control. She asserted that “many other kinds of professionals (and non-professionals) select or collect materials, preserve them, and make them accessible” but the archivist’s value stems from doing these tasks based on the tenets referenced above. She fears that historical context will be lost by basing archival practice on other ideas. Theimer is emphasizing the importance of the archivist’s role both to inform the public that this information needs protection and to demonstrate it is the archivist that should be doing it. While it is reasonable to defend these tenets in a societal and professional sense, the historical context of the theories and the emergence of digital materials calls them into question. Jefferson Bailey wonders how much the archival profession should be relying on Respect des Fonds (made up of provenance and original order) in his essay “Disrespect des Fonds: Rethinking Arrangement and Description in Born-Digital Archives.” Bailey revealed the theory’s contested past, showed that Respect des Fonds was born in a specific historical moment in France, and was merely a simplification of standards for new archivists, one that was never completely implemented there. He further demonstrated that multiple theorists have challenged these principles, complicating the idea that the archival core values are static and unchangeable. Additionally, Respect des Fonds becomes increasingly problematic when applied to born digital material. Bailey asserted that analog records have clouded the possibilities of describing records and that digital materials do not function in the same way. For instance, original order is unobtainable on magnetic disks that store information in multiple places with no inherent order. He did not dispute the utility of original order and provenance but instead believes “it is time to revoke their privileged place in archival discourse and revisit the true goals of arrangement and description in light of the capabilities of digital records.” With all the problems with archival theory, why defend it so vigorously in the defense of the definition of archives? It makes practical sense to defend the traditional idea of archives for professional reasons. Archivists have not been at the fore of handling digital material and part of this defense is reaffirming the archivist’s place in roles that would traditionally fall into their purview. Digital humanists and IT departments attempted to fill the void in recent years, handling the preservation and access to digital materials in novel ways. Though these groups have different understandings of an archives than the traditional archivist, should the archives profession fight them if, as Bailey demonstrated, the archival ideas prove problematic? It is my belief that we should be learning from each other. As Jaime demonstrated in her post, there are multiple ways to display and examine the context of a record just as Bailey stated that “the multiplicity of meanings possible with digital records can be better realized through an ongoing interrogation of archival traditions of arrangement and description.” Similarly, what I argue is for a multiplicity of meanings for the term archives, depending on the context of which it is used. The term can mean something and be useful in one field just as it serves its purpose within the archival field itself. I agree with Bailey in that the archival core notions need a reexamination. Archivists should embrace this complexity and learn from the other occupations to grapple with the digital material its terms of art are failing to fit. While it may feel wrong to allow other fields leeway into the archivist’s professional territory, failing to do so and learn from their innovations puts the archivist down a path where they could have no profession at all, relegated to only a mention in an archives somewhere.